Unique Moments Photography from Gig Harbor WA had the Honor to capture this fantastic image at the pickering barn in Issaquah Wa. This wedding was fantastic and had everything we could ask for for photography purposes at a wedding. Yes, it even rained a little bit and while most photographers are a little afraid of the rain, we welcome it especially at night. The Pickering Barn is a landmark for the Issaquah area and one of the better wedding venues in the state for a barn style wedding. The venue was actually a full blown Horse boarding barn and has been modified and turned into an event center. It really is a beautiful venue to have a wedding, especially in the fall and winter with the rainy season in Washington. We had full rain in the forecast of this wedding, but with rain breaks before the ceremony, we were able to get our bridal party outside to take advantage of the beautiful landscaped grounds. The inside area has a beautiful refurbished barn area for the ceremony for rainy weather and the dressing rooms where bride and groom get ready are completely remodeled and look awesome in pictures. What can we say, the place is a photographers dream for pictures. Its one our favorite " Cant Miss " venues. 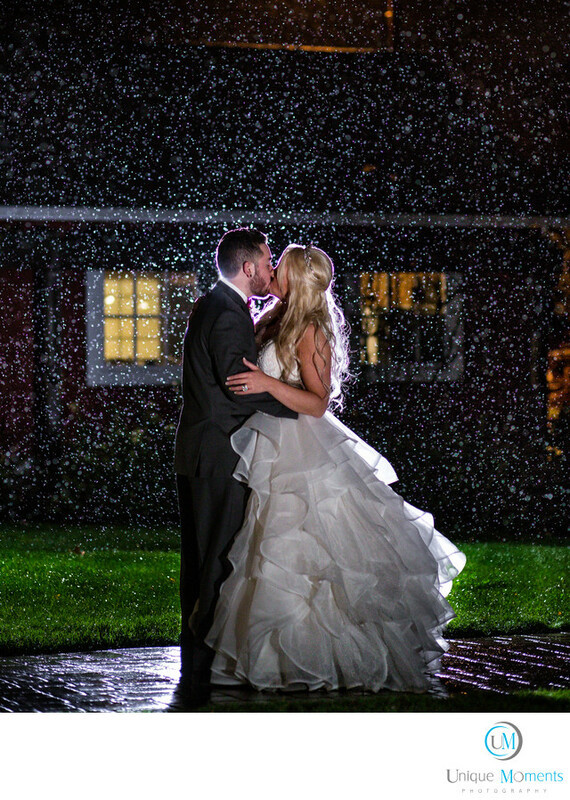 Just before we were about to leave, it started to rain pretty heavy and we knew that It was an opportunity to capture a great image for our clients. So with umbrellas in hand we went out and back lit our clients and filled from the frontside with another light to capture this fun shot. All we had to do was crop this one. Its straight off the camera. Rain is an opportunity to create a little magic with Unique Moments photography. This was one of our favorite weddings of the year and one of our favorite images for the 2016 season. Location: 1730 10th ave NW Issaquah WA 98027.